I’d like to tell you that this is a story about NACI, and the making of a “Reflections Doll”, but in truth, it’s mostly a story about me. Which is odd – I’m usually a pretty private sort, almost to the point of being anti-social at times. Nonetheless, here it is – a story about me, thinly veiled as a craft project. 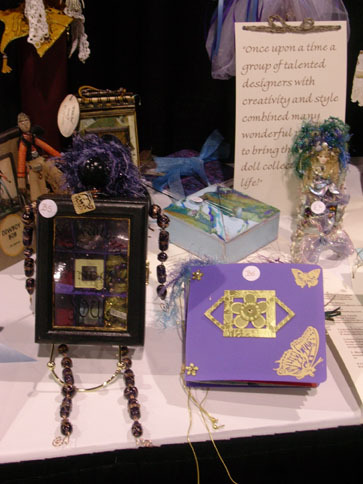 Several years ago, I signed up to participate in a Deco Doll Round Robin along with several other members of an organization known as the Society of Craft Designers. If you’re not familiar with the Round Robin concept, it’s where one person starts a project and others add to it until it comes full circle back to the creator. (Hmm, very much like living one’s life.) For the creative types in this particular scenario, we were assigned to small groups and each tasked to create the foundation for a doll and a travel journal. We then sent our creations off on a special journey to “visit” each of the other members in our assigned group, picking up special contributions and adornments before being passed along to the next person on the list. After making her rounds, NACI finally returned home with wonderful treasures and fabulous stories to share. But NACI’s journey didn’t end there, our Deco Dolls and travel journals were featured in a special display at the Craft and Hobby Association 2005 Spring Show (they were a big hit). After the show, NACI was featured in a related article that appeared in CNA Magazine. Those were exciting times for my little deco doll. NACI was carefully packed away when I moved later that year – the beginning of one of my own travel adventures. Over the next several years I would often find myself thinking about her, but life was happening, and I wasn’t especially inclined to dig through box after box trying to find her. Yes, I still had unpacked boxes occupying my space and openly defying the “one-year rule” of most professional organizers. One day I woke up with a feeling that I knew exactly where I would find her. I don’t try to explain these things, I just go with them. Sure enough, she was right there, waiting to be freed from the box I had put her in – the box I had used to keep her safe. Finding her again was very much like finding myself. So, if you’re up for it, I would like to share her with you in this story, and in essence, share a bit of “me”. One of the first things to pop into my mind with the Deco Doll assignment was to create a doll that was also a purse of sorts – I definitely have a thing for purses (more on that in a future post). Purses always seem to hold such an amazing collection of special treasures and important stuff. I didn’t write step-by-step instructions when she was created, this was a “just for fun” project. So, I will attempt to describe her key features and give you an idea of the process. Her head is a painted wooden ball wrapped with a scrap of fiber trim that just seemed to lend itself to becoming hair. Her neck is a decorative glass bead, and the copper wire is there for an extra measure of support and stability. This is all attached with a finishing nail. While her face appears to be blank, if you hold her close you can actually see your reflection, hence, a part of the reason I call her a “Reflections Doll”. The arms and legs were created from the same collection of decorative glass beads and 28-gauge wire. They were attached to the body with eye pins that I fashioned from 18-gauge wire. Her body was made using a wooden frame box that I sanded and painted. I replaced the glass insert with a piece of reclaimed plastic that was cut to size. Glass would have been a bit too fragile for this particular journey. I printed “Creativity the Window to My SOUL” on a window decal sheet and applied it to the plastic insert. I didn’t worry about the bubbles, they gave her character. Textured cardstock was used for the red background. To create the compartments, I covered medium weight cardstock with satin fabric. When NACI started her journey, only two compartments had been filled. Looking through the opening in the little gold frame in the middle compartment I see a cross, and behind that, a mirror with my reflection in it – part two of the reflections theme. It is a reminder of my faith, and to keep God at the center of my life. In the top compartment to your right is a heart behind a clear cover. That serves as a reminder that my heart needs to be protected, but not hidden. And, much like a sword in a stone, the key is there – waiting for the right person to come along. When NACI returned home from her Round Robin journey, I happily discovered that my fellow Designers had captured the true essence of my Reflections Doll in their contributions. 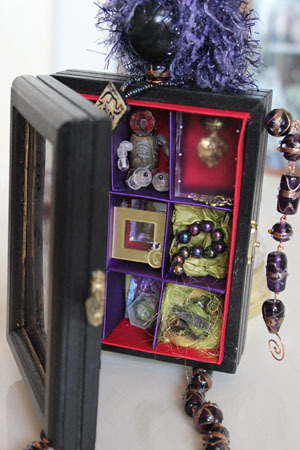 Each of her wonderful little treasures reflecting a special message of hope and inspiration. The crystal figurine reminds me that I have an inner child who needs to come out and play from time to time. It keeps my imagination alive. The beads remind me that it’s OK to enjoy some of the finer things in life, and that I don’t have to wait until I’m old to wear purple. The bottom compartments hold the cutest little handbag, one of my favorite things, and the word “wisdom”, which is something I have prayed for on more than one occasion. If wisdom is truly linked to gray hair, I have a lot – of wisdom. Although you can’t actually see treasures in the remaining compartments, I don’t think of them as being empty, but rather, yet to be filled. It’s a reminder that I still have room for growth, and discovery, and for living life. Thanks to one of those rare moments of near-perfect clarity, my doll had finally escaped the constraints of the box she was once in. I sat her in a place of honor on the dresser near my bed so that she would be one of the first things I saw when I woke up, and one of the last things I saw at the end of my day. On my most recent move I kept her with me instead of packing her away. The dresser is still in storage, but she sits where I can see her. She is a reminder of my spiritual center and my creative soul. And, when things get a little crazy, she’s there to remind me that life is indeed a journey. A journey that has led me to the special treasures that fill my life today; a journey that holds the promise of so much more that is yet to come. 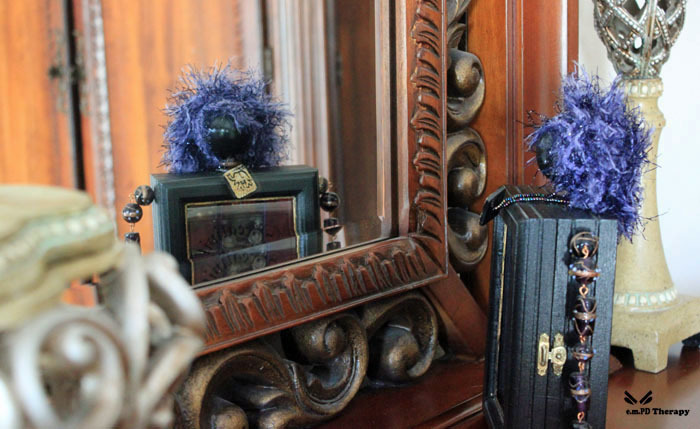 Well, there you have it – that’s my story about NACI, my little Reflections Doll. I know her name may seem to be a bit unusual, but it comes from a character in one of my short stories that you can read here. 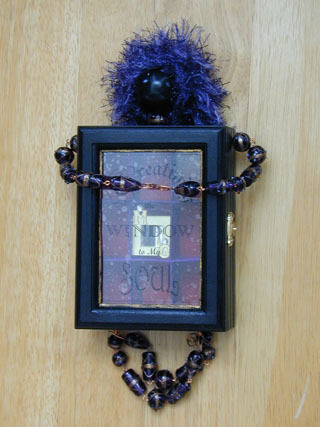 So, how would you like to make your own Reflections Doll? There are no rules – just follow your heart, and enjoy the journey.